How is it already Wednesday? I've been thrown off my blog schedule thanks to a non-compliant computer and I'm not pleased. We were meant to have a little Mirabella chat on Monday. Oh well, since we've got lost time to make up for, well, I do anyway, let's get to the gorgeousness. 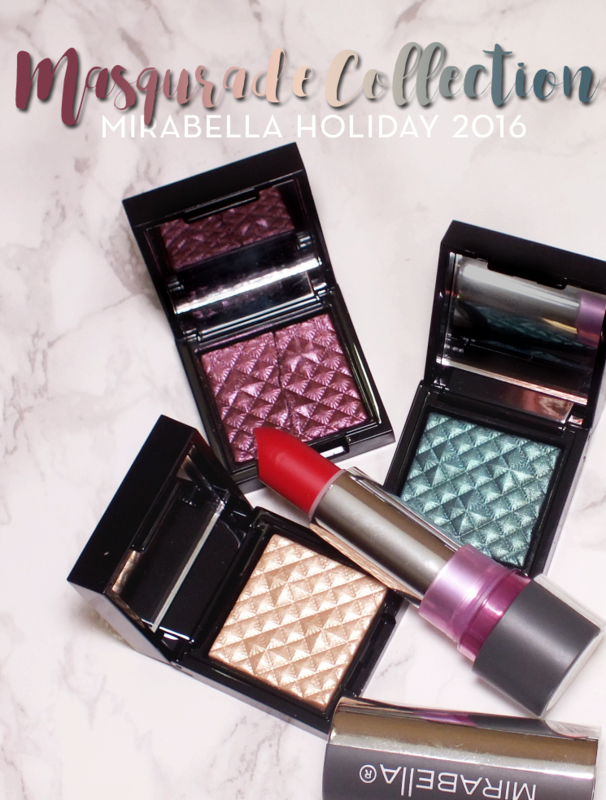 For holiday 2016, Mirabella has launched the Masquerade Collection, a pretty little collection to see you through the season in style. 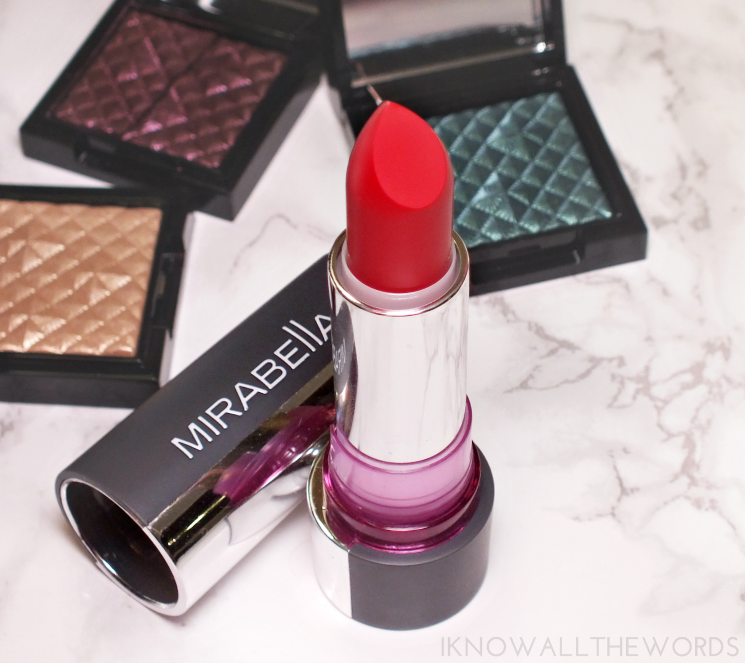 The Masquerade Collection consists of two main products, on for lips and one for eyes. As you can see, that's where we're starting. The Eye Lights are just to stunning not to get right to them. 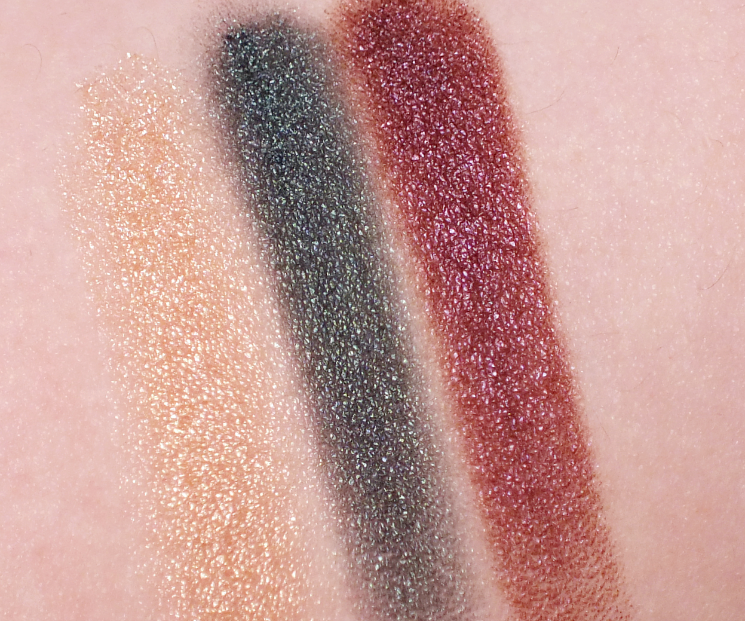 The single shadows have a intricate, raised, quilted pattern and come in three holiday-perfect shades: Gilt (a warm champagne), Charade (blackened teal), and Mystery (plummy-cranberry) all have the same buttery texture and softly shimmering finish. 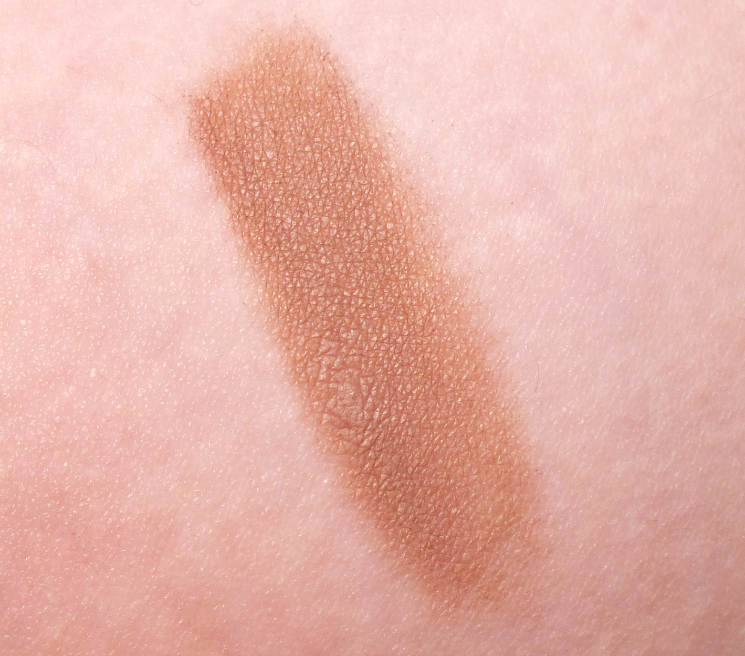 While these are powder shadows, the texture has a creamy feel that applies and blends easily. Lips get the matte treatment with the Modern Matte Lipstick in Crimson. 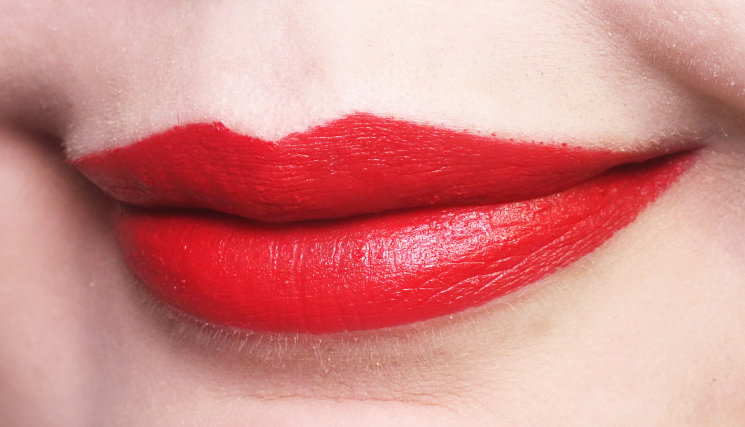 The matte formula of Crimson is softer and much easier to wear than many full matte shades. I'd call Crimson a soft-mate, as there is the softest amount of sheen and the formula never feels drying. It has a very foodie scent- kind of vanilla candy-ish- that I love, but isn't overpowering and not noticeable once applied. Crimson is a perfect holiday red, as it's quite classic, not too warm of cool and doesn't read too bright or too deep. 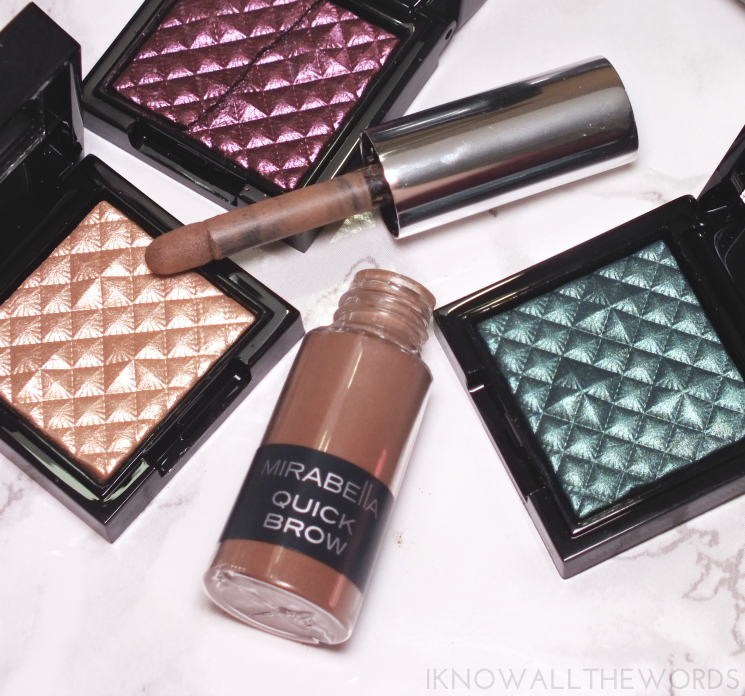 Quick Brow isn't officially part of the Masquerade Collection, but I haven't had a chance to feature it, so I thought I could just pop it in, bonus style. Quick Brow is a brow powder that works to fill in brows with a soft, natural effect but has a unique mess-free formula that stays in place. Application is also cleaner that your typical loose powder, as the sponge applicator grabs onto product. Sweeping it through brows distributes product with zero fall out. I received the shade Medium, which isn't quite deep enough for my brows, but when I pair it with the Mirabella Brow Pencil (an all time fave) in Dark, I can create perfectly filled in brows with a natural (but better than) look. Overall, a nice little holiday collection. 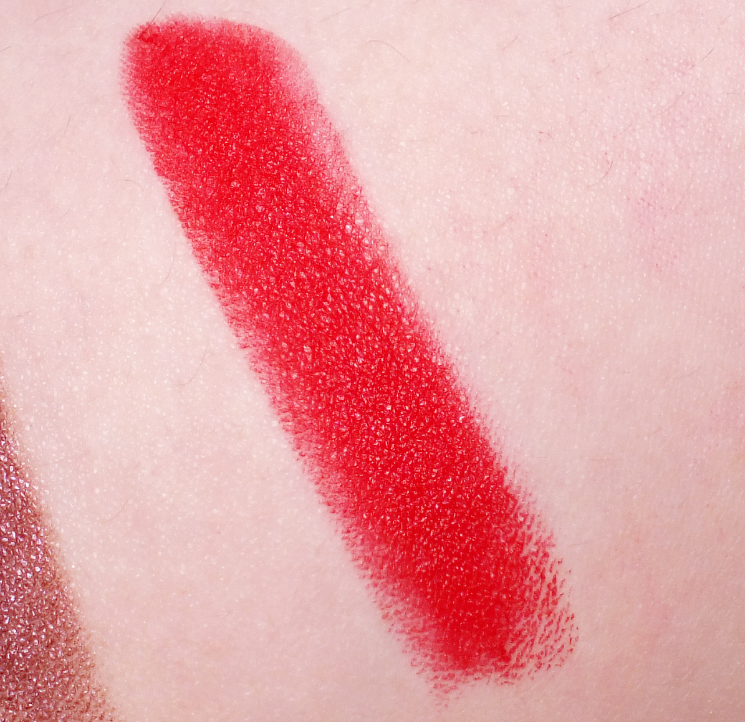 Red lipstick lovers will love Crimson, nut in this case, it's the shadows that I really love. The shades come together nicely for a easy holiday-themed look (add a touch or matte black in the crease for more drama) and are easy to travel with too. What do you think? 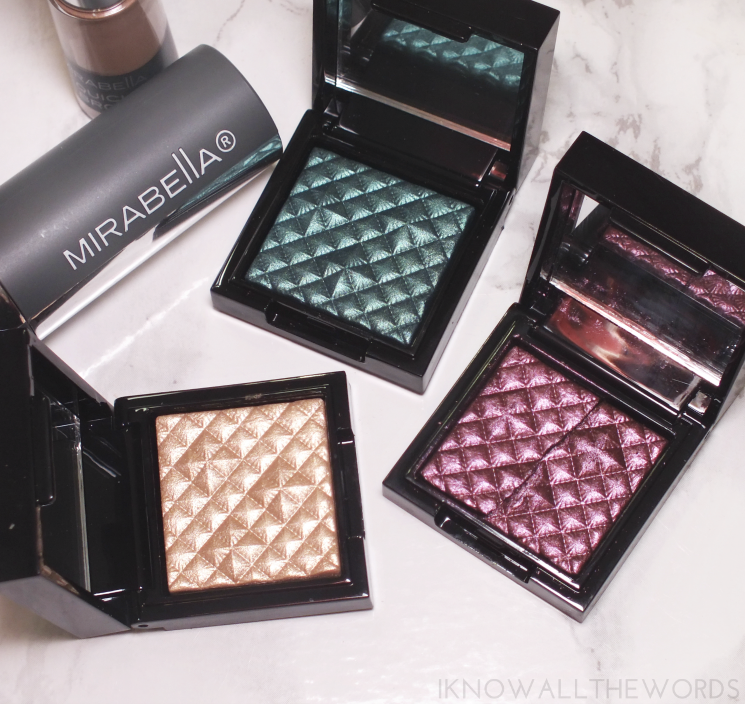 Need any of these pieces in your makeup bag?